I love spring, but it doesn't love me! I have horrible (as if there were any other kind) spring allergies, but Flonase® Allergy Relief allows me to be better than my allergies... and bring spring indoors. My Mom has a green thumb and can make any flower flourish. I wasn't blessed with as much of a green thumb, but I did inherit her appreciation for flowers. At the top of my favorite flowers list are peonies and ranunculus, but daffodils and tulips scream spring to me. Since I can't grow them as well as she can, cut flowers have become an obsession of mine. From simple bouquets, to elaborate displays, to intricate arrangements, the more flowers the better. Having them in vases around my home always makes me smile, and think fondly of my Mom, but my allergies are a drawback to my obsession. At the first hint of spring, it becomes difficult to manage my allergies and I start sniffling, get a runny nose & itchy eyes, and look and feel horrendous. And the sneezing... oh my gosh... is horrible. 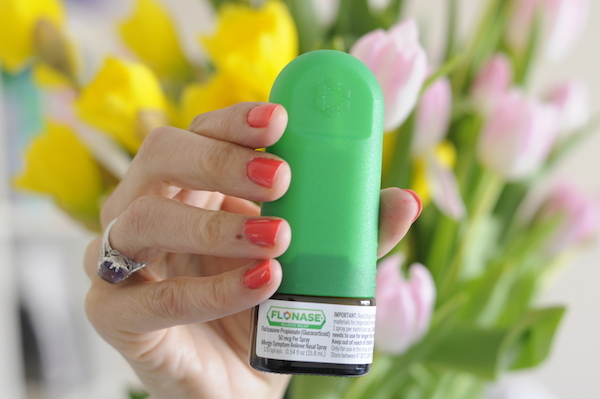 Flonase is a simple once-a-day nasal-spray that I use to help me manage my allergies! Just 2 quick sprays in each nostril and I'm able to enjoy spring and be greater than my allergies. I still do these preventative measures, but when I take Flonase daily, I can rest assured that if I bring the outdoors inside, I can still be greater than my allergies. What a relief! I know I'm not the only one with spring allergies: what are you allergic to and how do you enjoy spring without suffering from allergy symptoms? FLONASE® Allergy Relief compensated me in connection with this blog post.